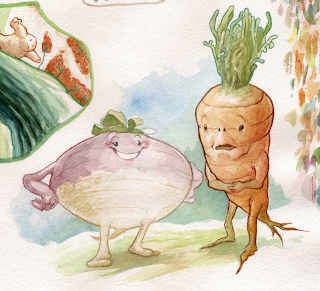 After painting the carrot guy for the last watercolor wednesday, I decided he needed an overly confident friend! And, uh, a rudimentary background. Featureless voids make me uneasy! 1. Sketched out drawing. Was pretty okay with it. 2. Suddenly developed violent hatred for sketch, scrapped it altogether. 3. 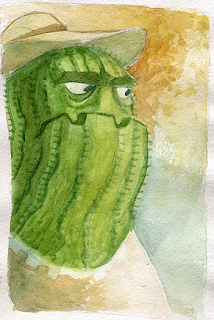 Whipped out watercolor paper, scrawled out a totally different composition. 4. Started painting, began to realize the darker shades of green were totally not working out the way I wanted them to. 5. Put painting out of my line of sight. Glanced at it once in a while, hating it from afar. 6. Finished painting by adding spines and little details here and there. Once again, the moral of the story is BE PATIENT, STUPID. I will learn from my mistakes someday! What typical process do you usually go through for a painting or drawing? And please please keep it up~!!! I was kind of intimidated by them at first, and STILL am to a degree, but it helps to start out small and work at it in layers. Also, certain brands are SUPER CHEAP and give you a ton of tubes of paint (I'm still using the box of Reeves watercolors I bought something like three years ago) so there's no need to worry about wasting them.